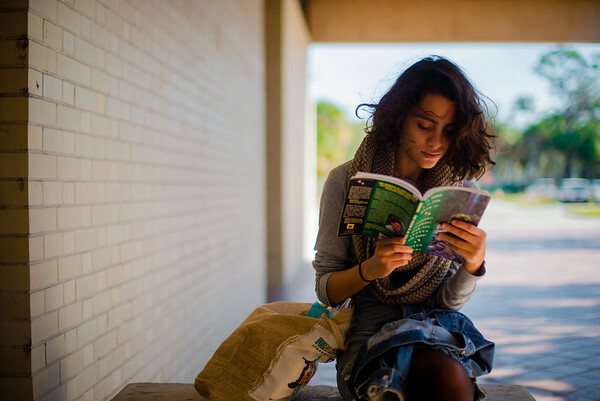 Why Study Literature at New College? Few disciplines better symbolize the rich tradition of the liberal arts than the study of literature, and our Literature AOC at New College is no exception. Offering both the breadth and depth you would expect from one of the nation's top-ranked liberal arts colleges as well as the level of individualized attention and mentorship that are hallmarks of New College, our program prepares students with the analytic, critical thinking and communications skills required in almost any career. If you want to explore — read, discuss and analyze — literary works of different genres, from diverse historical periods and cultural traditions, then our Literature Area of Concentration (AOC) could be the ideal fit for you. From Shakespeare and Homer to Dostoevsky, Goethe, Proust, Austen, Woolf, García Márquez, Adichie, Castellanos and Yu Hua, our program gives you the opportunity to work across linguistic, national and historic boundaries in your approach to literary study. As a Literature student, you can pursue courses and tutorials that focus on a wide variety of topics. For example, some of our Literature students want to dig deeply into Latin American novels or French fin-de-siècle fiction. Still others want to explore Chinese film, American experimental poetics, German bourgeois dramas or philosophical Russian novels. Whatever your interest, you will work side by side with faculty members who teach across the spectrum of our language and literature programs. You’ll also have the opportunity to explore a broad range of approaches, applying your analytic skills not only to written texts, but also to performance, film, visual and digital media, and more. Our Literature AOC is also a good gateway for students interested in studying, working and traveling abroad. Because of the program’s cross-cultural emphasis, many students have chosen study abroad while at New College while others have gone on to earn Fulbright Scholarships or teaching assistantships through the French Government, JET (Japan Exchange and Teaching) program and others, following graduation. This concentration is designed for students wishing to study literature but not to specialize in the literature of a single national or linguistic tradition. The requirements and procedures for AOCs in Chinese, English, French, German, Russian, Spanish and Classics are distinct from those of our Literature AOC. Graduates from the program have become teachers at K-12 institutions and faculty members at colleges and universities both in the U.S. and abroad. They have also become lawyers, librarians, journalists, publishers, web developers and entrepreneurs. In short, they have pursued careers in the nearly countless number of fields where their language skills, cultural flexibility and critical thinking abilities are valued. Students in our Literature AOC typically do coursework in at least three national or linguistic traditions. Senior theses may be cross-cultural in scope, or focus on the works of one tradition, historic period, or author. Some examine diverse works through one critical lens. Because there is no substitute for reading work in the original language, students are expected to meet at least a minimum language requirement (completion of a course at the Intermediate I-level or higher), even if their thesis focuses on literature in English or in translation. Every semester, we also offer courses and tutorials where students can read and analyze texts in the original, whether Chinese, French, German, Greek, Latin, Russian, or Spanish. Working with faculty from all of our language and literature programs (Classics, Chinese, English, French, German, Russian and Spanish), you will sharpen your analytic skills through close readings and in-depth discussions of texts and gain a deeper understanding and empathy for people from different backgrounds and traditions. By studying the historical and cultural contexts of texts and applying literary theory to them, you will also come to better understand the nature and purpose of literature itself. Ultimately, all of these will help you gain a richer appreciation of the artistic uses of language and a more sophisticated ability to express your own ideas, both in written and oral form. Our curriculum requires students to complete courses and tutorials that demonstrate familiarity with literature from diverse historic periods (pre-1700; 1700-1899; 1900-present), of different genres (prose fiction, poetry, drama/theater), and of multiple national or linguistic traditions.